Now available on Steam & GOG.com! In The Shadows Now Available! In The Shadows is now available on Steam and GOG.com! Soundtrack album available on Bandcamp! Follow Colorspace Studio Facebook page to stay up to date on future events and announcements! Get all the news and more! 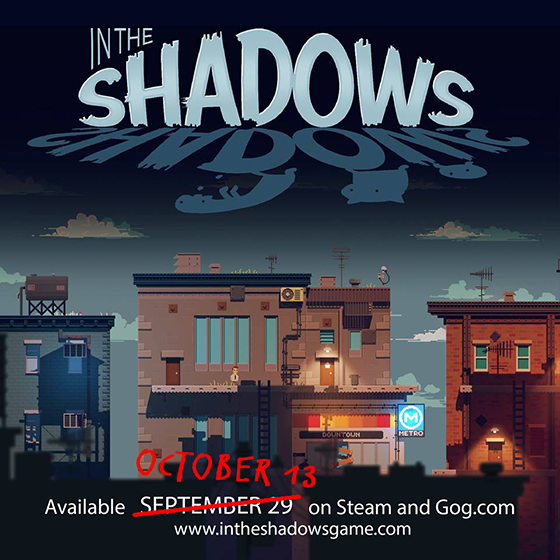 In The Shadows Soundtrack album will be available October 13th on Steam and Bandcamp! Special treat! You can listen to a track here on YouTube! Album available for preorder on Bandcamp! In The Shadows Release Date! In The Shadows will be released on Steam and GOG.com on September 29th October 13th for PC,Mac and Linux! Go check out the release date announcement trailer on YouTube!! In The Shadows in Closed Beta! 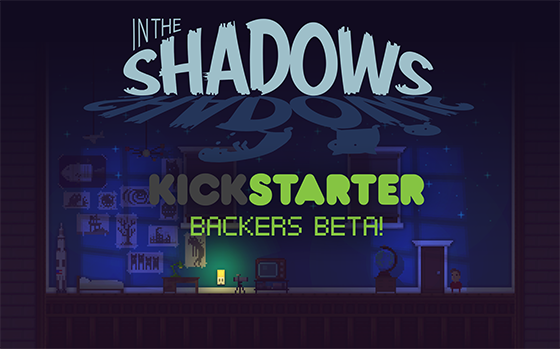 In The Shadows has now entered the beta phase! If you are a Kickstarter backer in the "beta tier" you should have received a Steam key by now, which gives you access to the Windows build. Make sure you have the right email adress entered in your Kickstarter survey, you should really check your email inbox! You can read more about all of this and more on the Kickstarter April update! 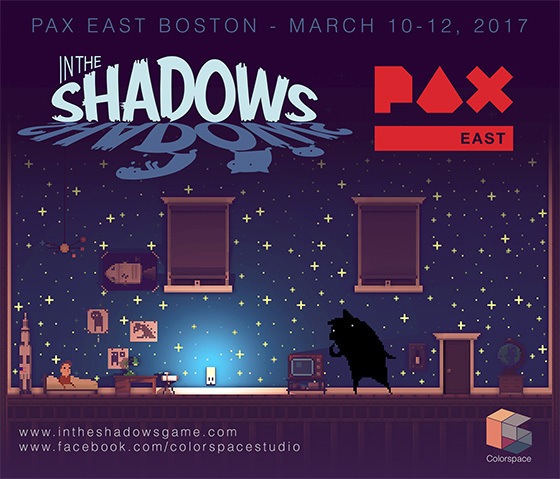 In The Shadows will be at PAX East 2017 in Boston, MA March 10-12! 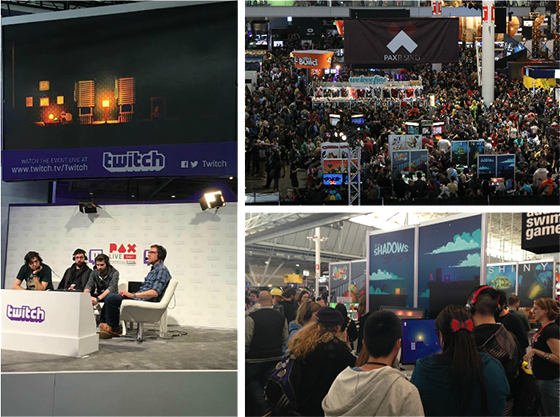 This is kind of a surprise and I'm really happy that I can show my game again this year to the huge crowd at PAX East. The game will be displayed at the PAX Rising booth section, I hope to see you there! You can read more about the event and other news on the February Kickstarter update! If you don't want to miss any important information, don't forget to follow Colorspace Studio Facebook page to stay up to date on future events and announcements! 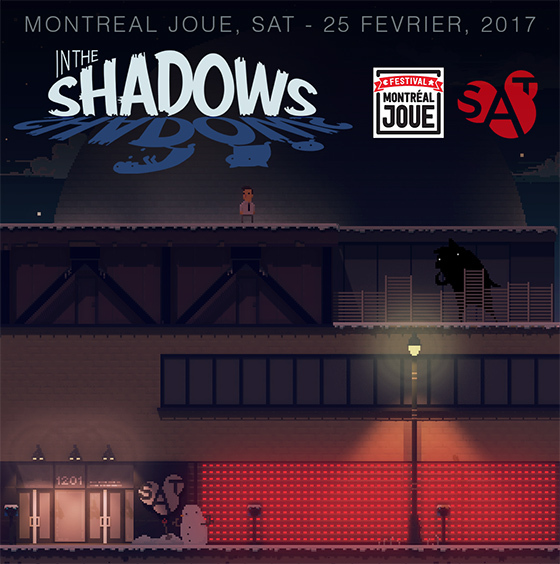 Small update to let you know that In The Shadows will be playable at Montréal Joue Indie game show in Montréal at Société des Arts Technologiques on Saturday February 25! The event is free, open from noon to midnight. The bar (18+) opens at 7pm. Check out the Facebook Event for more information! 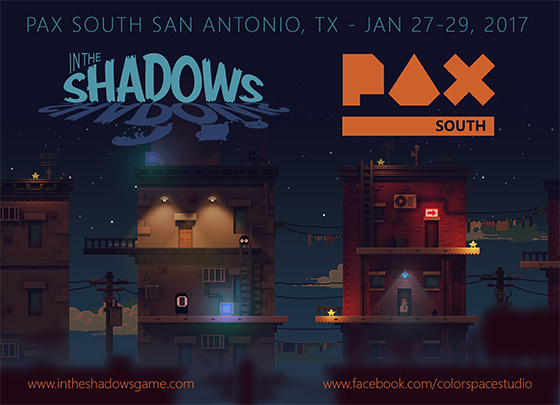 In The Shadows will at PAX South 2017, in San Antonio, TX January 27-29, at Henry B. Gonzalez Convention Center. Come by booth 11210 to try the game! You can read more about it on the Kickstarter update! Follow Colorspace Studio Facebook page to stay up to date on future events and announcements! 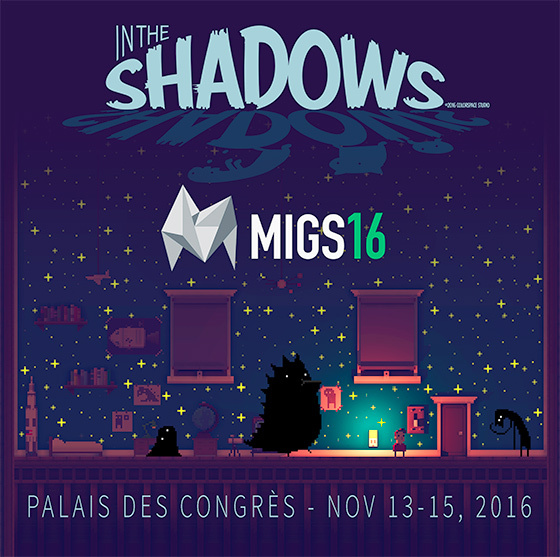 In The Shadows at MIGS 2016! In The Shadows demo will be playable at Montreal International Game Summit from November 13th to 15th, at Palais des Congrès in Montreal. More information on the MIGS Facebook event here! Steam Store page now live! In The Shadows Steam store page is now live! You can now already add the game to your wishlist, this way you will get news and updates directly from Steam. Spread the word! Share the link! You can read more about this on the Kickstarter October Update! In The Shadows at MIGF 2016! 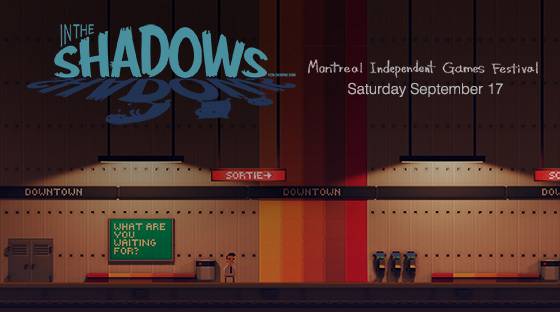 In The Shadows will be at Montreal Independent Games Festival on September 17! You should come check it out, play a bunch of cool indie games! You can find more info about MIGF here! Kickstarter August update and survey! In The Shadows is progressing well and I just sent out the Kickstarter survey to all the backers! If you are a backer, check your email inbox now and take the time to fill out the survey! It is important for you to send it back to me, this way I will know for which platform you want your game Key. Keep in mind that the game will be released on Steam first at the end of this year, but the console version on Playstation and Xbox One will be released later in spring 2017. If you have any questions about the survey you can send me a message through the Kickstarter messaging system and I'll reply as soon as I can! Read more about the August update here for more details about the current development of the game. 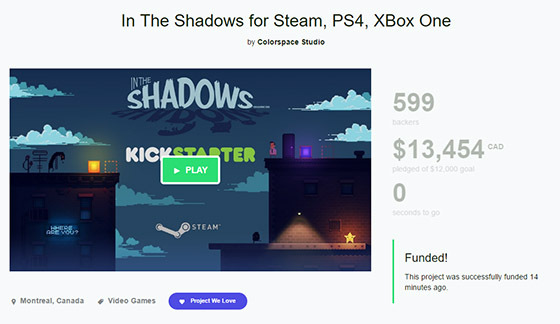 At 11am this morning, In The Shadows has been successfully funded! Thanks to all the backers and supporters, I could not have done it without you! This means that the game will be available on Steam at the end of this year for PC, Mac and Linux, and on Playstation 4 and Xbox One in spring 2017! Stay tuned for more updates and don't forget to follow me on Twitter or on Facebook. This is it, It's the last stretch for the Kickstarter campaign! There is less than a week left and we are at 80%! We need a little boost for the end, we are almost there! Spread the word! Let's make this happen! Thanks to all the backers, I will make a great game for you! I am sending the first email for the mailing list today! This is new for me, but I think it's a good way to stay up to date about what is going on with the game without having to check the website all the time. I am sending out the first newsletter today at 11am, if you subscribed to the mailing list by adding your email on the notepad at the PAXEast booth and you didn't receive your first email yet, it might be because I couldn't read your handwritting. There is around 20 emails that I just couldn't figure out. You can subscribe by yourself here, or by clicking the subscribe button at the top of the website. If you changed your mind you can unsubscribe easily by clicking the unsubscribe button in the mail. The mailing list is powered by Mailchimp and should work pretty well. Coming to PS4 and Xbox One! 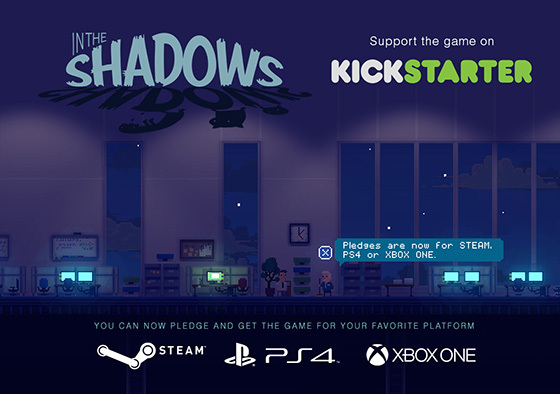 I am happy to announce that In The Shadows will be coming to PlayStation 4 and Xbox One in 2017! The game is still scheduled to be released first on Steam for PC, Mac and Linux at the end of 2016. You can read the official announcement for PS4 on the PlayStation Blog. How does this affect the Kickstarter? The console version is also available on the Kickstarter as a reward. All the pledges rewards include a digital version of the game and when the campaign is over you will be able to select via the Kickstarter survey on which platform you want your game key once it is released. You can read more about the update on Kickstarter here. Thanks to all the backers and don't forget to share the Kickstarter page on Facebook, Twitter, Tumbler to help me spread the word! I am back from Boston, PAXEast was a really nice experience. Hundreds of people got to try In The Shadows! To everyone who have signed up for the mailing list expect an email soon! I will also add a form on the website sonn for people to subscribe to the list directly. Thanks to everyone who played the game! I am currently at PAXEast 2016, if you are coming to Boston, come take a look at In The Shadows! You can play a demo of the game at booth # 6548 ! In other news, the Kickstarter is doing great! Thanks to all the backers! Continue spreading the word! 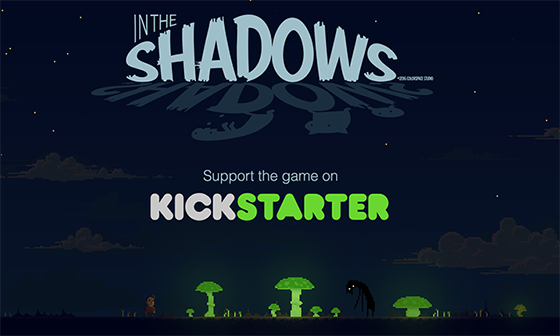 In The Shadows is now Live on Kickstarter! Help me by becoming a backer and spreading the word about it! You will get a copy of the game on release for any pledge you make! Also available is a pledge with the soundrack by Lombus! Check it out! Thanks to all the future backers! It only took 7 days and In The Shadows has been greenlit! You can still follow the game on Steam here so you get announcement and updates. The game will be available on the store later this year. Thanks to everyone who voted for the game, almost 3000 yes votes in a week! 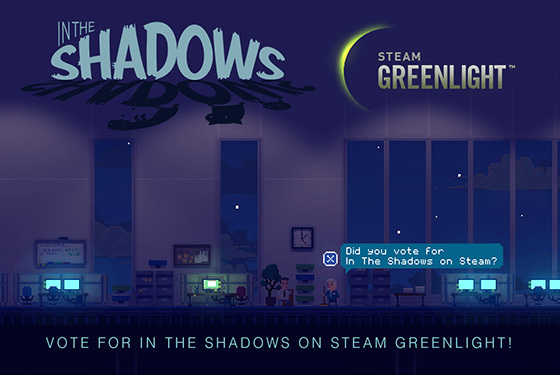 In The Shadows is on Steam Greenlight! If you would like to see the game in the store when it is released later this year, take a minute to vote for it on our Steam page! Spread the word! Tweet it, share it! Also check out the new trailer now online on youtube! 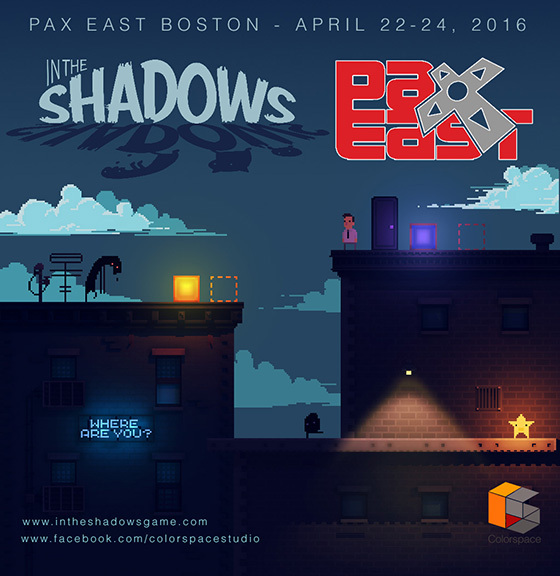 Announcing that a demo of In The Shadows will be playable at PAX East 2016 in Boston April 22-24! The game will be playable at the PAX Rising booth section all weekend, I hope to see many of you over there! Back from GDC! It was nice seing you all over there, so many people played the game it was incredible. I really enjoyed watching you play my little game, stumble onto bugs (sorry about that) and wrap your head around some puzzles! 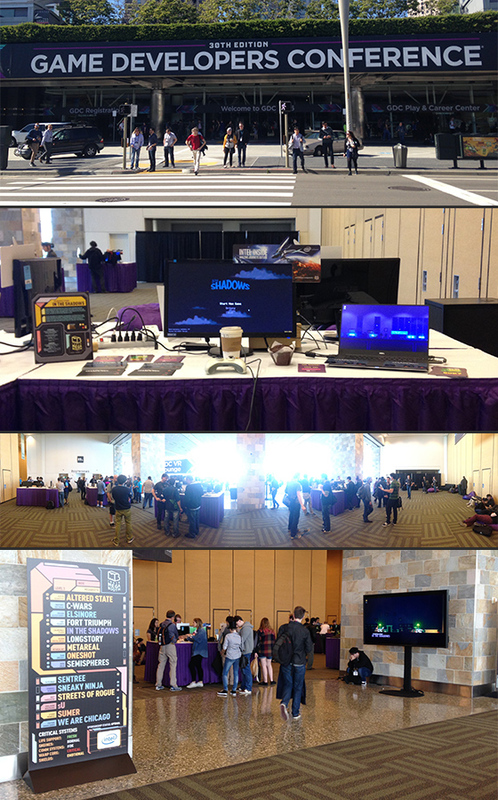 San Francisco was great, it feels good to travel a bit, even more so when it's for showing my game to the world. 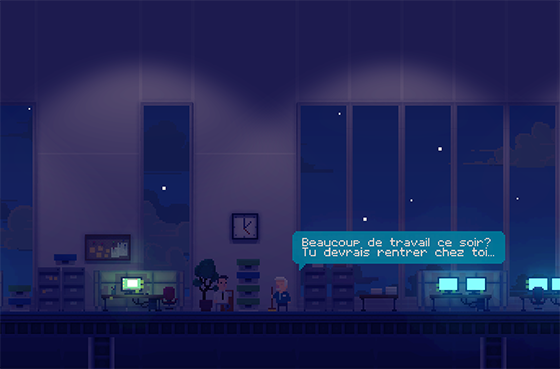 Back to work after Jeux Indie Montreal 2016. 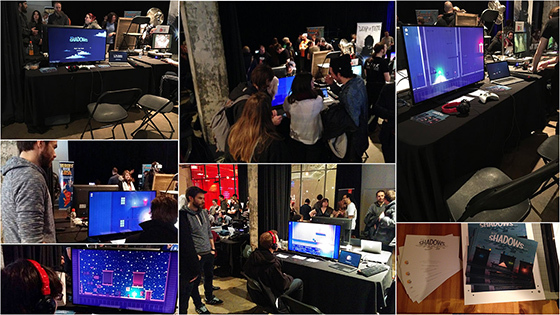 Lots of people showed up at the event, there was around a thousand people who came to play indie games. It was great to see so many of you play In The Shadows. I got a lot of great feedback, thanks to everyone who played it! Two weeks left before GDC in San Francisco! 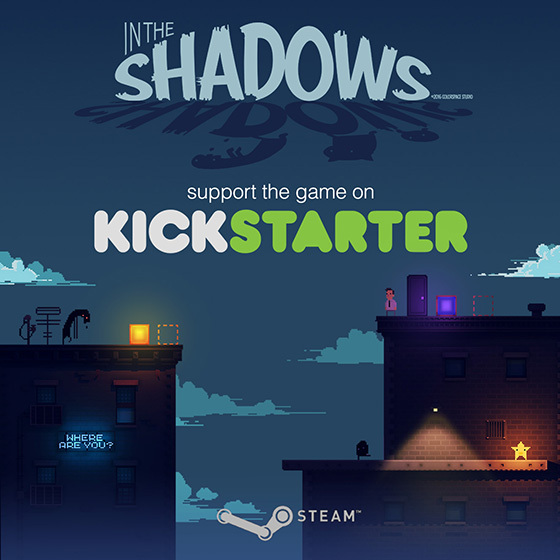 In The Shadows will be at GDC 2016 in San Francisco with the help of IndieMegabooth! You will be able to play the demo of ITS and 14 other great indie games. I will be there to show the game so if are going to GDC come say hi! Also don't forget to check out Colorspace Studio Facebook page for all major news and updates about In The Shadows! 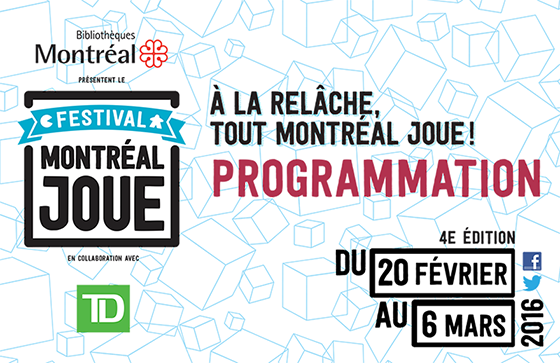 In The Shadows will be at Jeu Indie 2016 in Montreal on February 20 with the help of Festival Montréal Joue! A demo of In The Shadows will be playable in public for the first time! I am happy to show you In The Shadows first trailer! I hope you enjoy it! In The Shadows Teaser is now online! Announcing "In The Shadows" ! I've been working on this project for a while and I'm happy to finally show some of the work being done more officially. This will be the main source for news and information about the development of the game, and everything related to it. 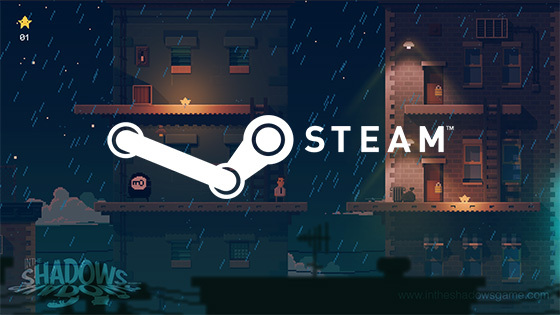 "In The Shadows" will be released in mid 2016, for Windows, Mac and Linux. Follow me on Twitter if that's your thing, I'll try to post information and updates regularly.